Many Mac users arriving from the land of Windows PC keyboards will notice that the Apple keyboards as well as those included on a MacBook, MacBook Air, or MacBook Pro do not have the standard “Page Up” and “Page Down” keys. 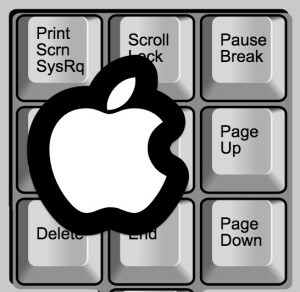 This does not mean you can’t page up and page down on a Mac, however, and, similar to the Home and End functions, there are two distinct ways to accomplish the equivalent of paging up and paging down on any Mac keyboard with Mac OS X.
Let’s quickly review the keystrokes to accomplish paging on Mac keyboards. 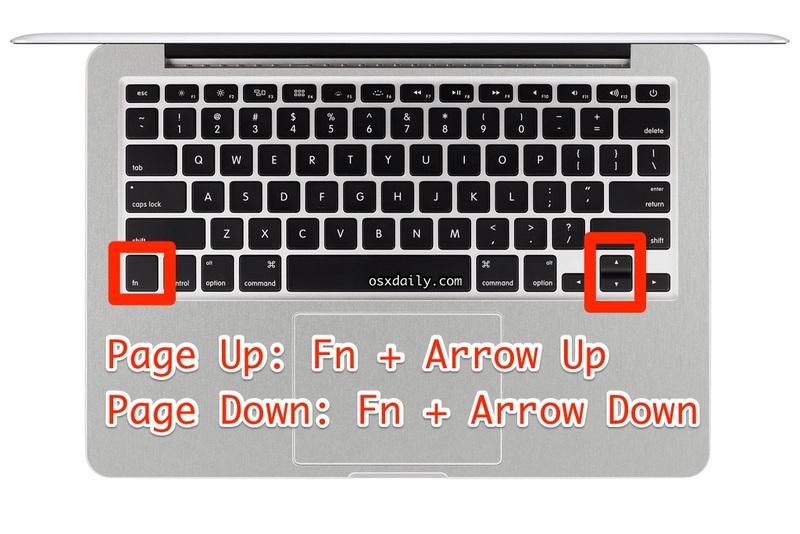 The “fn” key is at the lower left of all modern Mac keyboards, and when you combine that with the Up arrow, which is found on the lower right of the keyboard, you will perform the equivalent of a page up. Paging down is done the same way as paging up, using the same “fn” key and the Down arrow to perform the equivalent of a page down on a Mac keyboard. Yes, this is the same on all Mac keyboards, including the Apple Wireless Keyboard, the MacBook Pro keyboard, MacBook Air, and MacBook keyboards. The Apple Extended Keyboard has dedicated Page Up and Page Down keys, but this Function+Arrow trick will still work on that keyboard as well. Speaking of Function key tricks, those arriving from the PC world may also find it useful to know that Function+Delete does the Mac equivalent of the DEL key on PC keyboards, and there are many other function key modifiers to perform similar actions on the otherwise more minimalist keyboards commonly seen on Mac hardware. Knowing the appropriate Page Up and Page Down shortcuts can be particularly helpful with other text navigation keystrokes like these. Of course another approach would be to modify the scrolling speed for the trackpad or mouse the Mac is using, but that’s obviously not using the keyboard. Assuming the cursor is not in an active text box, hitting the Spacebar will Page Down in Chrome, Safari, and Firefox. Again, assuming the cursor is not selected into an active text box or the URL bar, hitting Shift+Spacebar will perform a Page Up in Safari, Chrome, and Firefox. Or, cheat like me and use a Logitech K750 for Mac and get all those buttons. Not a windows user, but I’ve always found them useful. Frome iBook G3 to MacBook 2014… Hot keys doesn’t changed… I think it’s cool! Another great tip! Thanks Paul!! The headlines are often misleading. While you DO state in the first paragraph that this applies to MacBooks, the rest of the article doesnʻt specify but just mentions, in one place, the fn key and “modern Mac keyboards”. Nitpicking I know. While this article is probably the least egregious, I often run across articles on OSXDaily that just launch into the subject of keyboard shortcuts assuming that everyone on a Mac these days is using a MacBook of some flavor. No this headline is completely accurate, the page up and page down keys are obvious on my keyboard after I read the article, it makes sense to me on all of my Macs. Function Up, Function Down. What’s hard about that? What keyboard are you using that doesn’t have a function key? Furthermore, most Macs are MacBook Pro variations, or the iMac or Mac Mini or Mac Pro with an Apple wireless keyboard. If you’re using an unsupported PC keyboard on a Mac, that’s up to you. Complaining that they don’t assume everyone is using an Apple II with an Apple II Keyboard is a little silly. Nitpicking? Yea, I’d say. How much do you pay for this service? A big $0? People want to complain about everything, get a life. What hard is remembering is it Fn + arrow key or is it shift, control, option/alt, command, or any combination of the above. This is the reason why I use Apple’s “Keyboard with Numeric Keypad” also know as “an almost normal keyboard” only if it had a freaking insert key. Great tip. Never really thought about the page up/down keys. I was forced to use PC at work, but have been a Apple user since my first iMac. It was the Red one we call Ruby. You must need them in Microsoft software. I have the wired keyboard with my Mac mini. It has page up/down but I never use it. Never knew why this would be useful, but I guess some people have uses. How do you select text to start/end of the file, using a Mac? The shift-fn-arrow key combination doesn’t seem to work. Cmd + Shift + Up/Down arrow, to select to the start/end of the page. Also, Cmd + Shift + Left/Right arrow, to select to the start/end of the line. Mac keyboard shortcut updated to Option + UP/DOWN for page down. Use Command + UP/DOWN for home or end. Those keys are on opposite side of the keyboard, and don’t have closer mirrors. That’s great if you can use two hands at once; not so great if you can’t; the shortcut doesn’t work with Sticky Keys. Just use Command or Option keys. Only need one hand. not having dedicated pgup/pgdn keys is a drag. is there a way to map the right command and right option buttons to act like pgup/pgdn? i’ve tried ukelele and kariboner but neither of them can do it. THANK YOU!!! Extremely helpful info!!! In LR I can go to the top left part of my photo in 100% with fn-left arrow on my Macbook pro. Then I can move to the next sreen in my photo with shift-fn-down arrow. In Photoshop I can go to the top left part the same way, but I have no clue how to go to the next screen. I need that to precisely go through the whole photo to see if everything is good. Has anyone an idea how to do that in PS? Why use the Fn key when you can use Command (start or end) or Option (page up/down)? They’re closer to the arrows and you only need one hand.